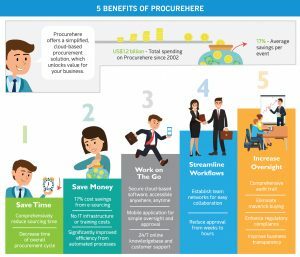 At Procurehere our goal is to deliver the easiest e-procurement solution to use, addressing the often complex problems which impact your business. So here are 5 simple but powerful ways Procurehere can help your organisation. Procurehere puts the user at the heart of our offer. We deliver a simple-to-use, user friendly procurement solution that meets your needs, without being bloated with the unnecessary functionalities with limited benefits that overcomplicate many rival platforms. The need to save time is vital to our business success. One recent US study showed employees in large companies spend 40% of their working time on meetings, administrative tasks or interruptions. By delivering a simple, cloud-based procurement solution, Procurehere not only eliminates the time spent managing sprawling internal IT infrastructure, but helps reduce the time you spend on unnecessary administration and meetings, leaving you free to deliver more value for your business. Time isn’t the only saving with Procurehere. Our cloud-based procurement links up sellers and buyers from across the world, opening up a global opportunity for e-sourcing and requisitioning that ensures significant financial returns for customers. Thanks to our flexible auction system, users have a range of options on how to best set up an auction process that delivers the greatest ROI for their project. Procurehere has realised an average saving of 17% per event across the more than US$1.2 billion of spending undertaken on the platform since 2002. Thanks to its cloud-based infrastructure, Procurehere unlocks your reliance on a physical office, opening up an on-the-go solution that better fits our fast-paced modern work environment. Users can login and access their accounts through our fully mobile-friendly web portal, or enjoy the ability to perform simple tasks through our free mobile app. And thanks to our 24/7 customer support, you’ve always got help on hand, whichever time zone you find yourself in that day. With a simple in-built approval processes customisable by the user, Procurehere provides businesses with increased transparency and improved sign-off for often high value procurement events. The easily referenced Procurehere dashboard also means previous events are easy to audit, reducing maverick buying and greatly improving your business oversight. The ability to move quickly can be a key determiner of success for any business. Thanks to Procurehere’s flexible team systems and simplified processes, users can create simple events for complex tasks that help streamline workflows and reduce challenges around turnaround and approval times. By creating a streamlined purchase requisition process through Procurehere, Malaysian logistics giant Westports managed to cut down approval time to just 8 hours, compared to up to a week for non-urgent approvals in comparable ports. Start your free Procurehere trial today, and see what simplified e-procurement can do for your business.